Agent Turnright Agent Turnright Complete 16 missions in this action packed retro one button game! An Agent of Change An Agent of Change You have crash landed on some retro graphic planet. Oh noes! Recover your space ship parts and go home, please! Emobaby Emobaby Everybody loves an emo baby! Style this too cute kid in fashionable and fun skull, heart and retro styled everything. Galaga Galaga Old flash retro remake of Galaga! 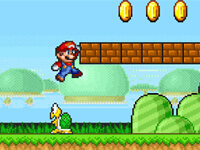 Mario Remix Mario Remix Three retro Nintendo classics in one Flash game. Play as Mario in Super Mario World, MegaMan, or Gradius. Missilebreak Outvaders Missilebreak Outvaders Defend your cities from alien invaders in this retro blend of three classic arcade games. Modern Medieval Modern Medieval Retro style archer game. Parachute Retrospect Parachute Retrospect Drop little men into the cart below, while avoiding more spikes, lasers, and saws! Final boss to pair! Pixel Crush Mania Pixel Crush Mania Are you ready for some old-skool fun? Then this retro pixel-art match 3 puzzler will be a pleasant surprise! Retro Ninja Blaste Retro Ninja Blaste Retro graphics and sound combined with classic arcade shooting action. 25 levels of ninja mania. Retro Racers 3D Retro Racers 3D Pump up those pixels in this retro-looking 3D racing game. Race toy cars around multiple tracks. Retro Rally Retro Rally Move the cursor to steer car, the further away the cursor is the faster you'll go. Pick up gasoline for extra speed! Scamper Ghost Scamper Ghost A fast paced avoidance retro pixel art game with ghosts, coin collecting, power ups, and slow motion. Seedling Seedling A retro adventure that Zelda fans will enjoy! Serious Dave Serious Dave Action adventure with a lot of shooting, platform jumping and a strong retro atmosphere, inspired by old console games. Super Mario Crossover Super Mario Crossover Play classic Mario levels as other retro game characters. Watch your step! We Are The Robots We Are The Robots Drop and match the robots in this retro-arcade game!